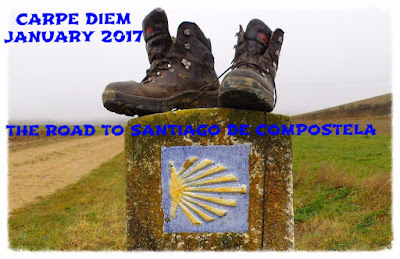 CARPE DIEM HAIKU KAI: Carpe Diem #1125 The Road to Santiago is part of the Tarot. Carpe Diem #1125 The Road to Santiago is part of the Tarot. !!! The Spring Retreat 2017 "fragile beauty" has started !!! Welcome at a belated episode of our Haiku Kai. We are on our way to Santiago, on our virtual pilgrimage to the shrine of Saint James. While we are on our way we are reading "The Pilgrimage" by Paulo Coelho. At the beginning of our pilgrimage I told you about the miracles of the Tradition, you will remember the story about Paulo's sword that he lost. It's that sword which drives him to walk the Road to Santiago, one of the most known pilgrimages on our planet and one of the most spiritual paths we will ever encounter. 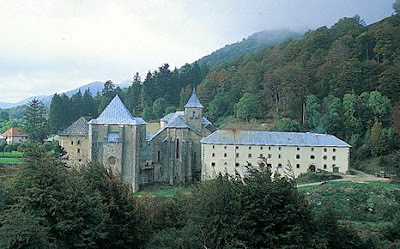 Today, as you can read in our title, I love to tell you a little bit more about the connection between the Road to Santiago and the Tarot. (To learn more about the Tarot, you can download the CDHK E-book about it in our library, or visit May 2013). Maybe you know that the Tarot works with 54 cards, it has a "major arcana" and a "minor arcana". As you can read in this conversation Father Jordi tells Paulo about the four pilgrimages. Paulo knows three of them, but the fourth he didn't know and I didn't know about that one too. It's the so called secret road, this points more towards the Tradition and more to the spiritual growth. Maybe we will see more about this pilgrimage later on this month. Those four roads are refering in their name to the Tarot and I hope to tell you more about that in episodes to come. This episode is NOW OPEN for your submissions and will remain open until January 20th at noon (CET).